Crowne Plaza Hotels & Resorts is part of the Intercontinental Hotels Group, the world’s largest hotel company – with over 674,000 guest rooms around the world, serving more than 150 million guests each year. 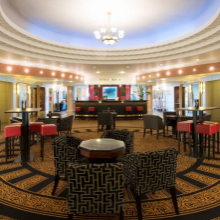 The Crowne Plaza Liverpool John Lennon Airport is a 4 star, Grade II listed building with art deco architecture and 1930s inspired interiors – facilities include 164 guest bedrooms, the Starways Restaurant, 12 meeting rooms and a wedding venue for up to 300 guests. “Tourism Growth’s ‘Marketing Your Wedding Venue‘ is an excellent training course – great trainers and some invaluable insights into free marketing! The course gave me a whole range of very good, practical ideas for boosting our weddings business which I am implementing here at the Crowne Plaza.